What Is Surround Sound and Do You Really Need It? If you are tired of all the cables lying randomly all over your home and you are searching for a hassle-free surround sound system for your home theater, the best thing you can do is to go wireless. Our article on 10 best wireless surround sound systems is designed to help you understand all the important things you need to know about wireless surround sound systems and make the best possible choice based on your needs and your budget. We have also made a list of 10 best wireless surround sound systems so you don’t even have to spend hours reading about different features of different products – you can read our reviews and find out everything you need to know to make a decision. 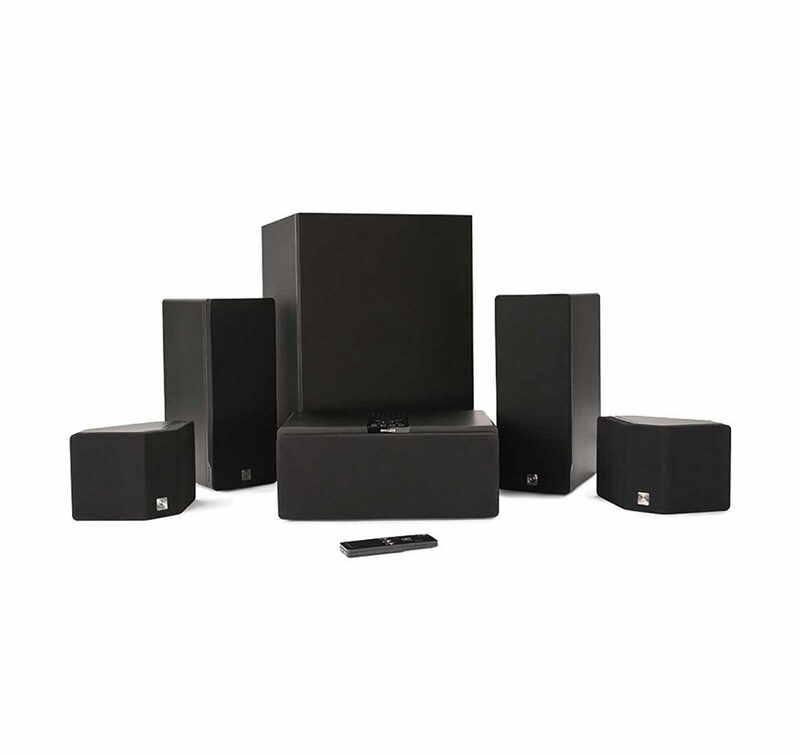 We have tried to list all the upsides and downsides of these surround sound systems and make your search much easier. Surround sound systems have been popular for quite some time. People simply love the convenience of having cinema-like experience without going to the actual cinema. The first surround sound systems appeared during the 1980s but they really became popular in the 2000s. A lot of technological innovations and improvements in audio and video equipment made it possible for regular people to have their own small home theater systems. Today, many homes in the US are equipped with some kind home theater system (TV or projector, DVD or Blu-Ray player, AV receiver + set of surround sound speakers). The experience could not be better, right? Well, there is still one inconvenience. Don’t you hate all those cables going under your carpet, or even worse, lying on the floor or dangling from your walls? 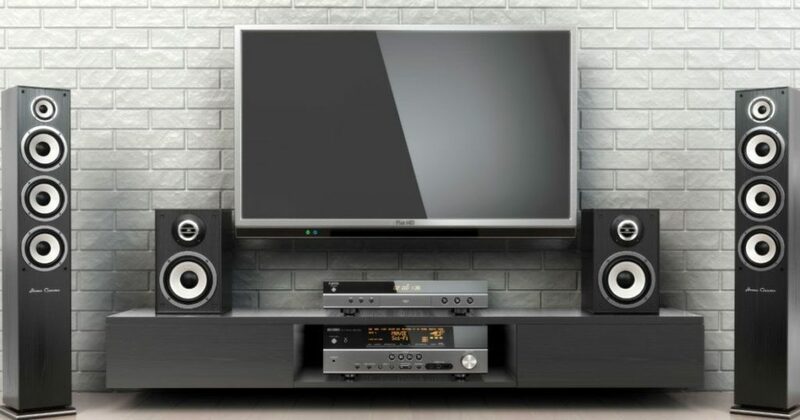 Unless your house or your entertainment center is pre-wired, you will have to spend a lot of time wiring your home theater system, connecting all the speakers to the receiver, and trying to make all those cables ‘’invisible’’. All that hassle makes you wonder if there is some simpler and more convenient solution. Well, as a matter of fact, there is. The last decade was really big when it comes to wireless sound. First, some portable Bluetooth speakers appeared. Then, the manufacturers made it possible for us to pair two wireless (Bluetooth) speakers and use them as left and right stereo channels. After that, wireless (Bluetooth and Wi-Fi) multiroom speaker systems appeared and, in the end, some wireless surround sound systems were introduced. These wireless surround sound systems are the main subject of our article and we are going to talk about different types of wireless surround sound systems, their characteristics, the amount of freedom they offer, different layouts (simulated and true surround sound), and we are going to present to you our list of 10 best wireless surround sound systems. Well, since you are here, you probably want something stronger than a pair of small built-in TV speakers. Surround sound is not the only option if you just want something louder than your TV. If that’s your only desire, you can check our articles on best wireless speakers for TV and best soundbars in 2019. If you watch a lot of movies (using Blu-ray, DVD, or some of the streaming services) with surround sound audio tracks (5.1, 7.1, etc. ), and you want to get the best possible experience, then surround sound system is what you need. Surround sound system puts you (the viewer) in the center of the action and makes you feel like you are in your own private cinema. Surround sound system is a set of speakers (you need at least 5 speakers and one subwoofer in order to call it true surround sound system, but you can also buy some smaller system (less than 5 speakers) that offers simulation of surround sound thanks to a little piece of software and to a specific driver placement). In a traditional (wired) setup you will also need some AV receiver in order to supply power and audio signal to all those speakers, but if you decide to go wireless, you are probably not going to need it (in some cases, the speakers are battery powered, in other cases each speaker has its own power supply cable or it’s powered by the subwoofer with built-in amplifiers). The most popular surround sound system configuration is 5.1 (5 speakers – 3 of them are in front of you (Front Left, Front Right, Center) and 2 on each side of your central sitting place (Surround Left and Surround Right) and one subwoofer). Today’s DVD and Blu-ray discs feature mandatory 5.1 audio track (Dolby Digital 5.1 or DTS 5.1 audio format). 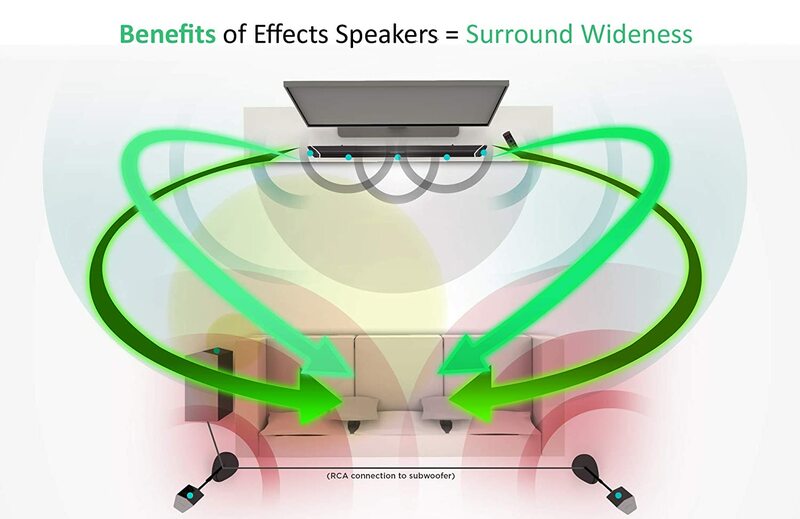 If you want to improve your experience even more, you can expand your surround sound system by adding two speakers behind your ”sweet spot” (Surround Back Left and Right) and get 7.1 or add an additional subwoofer and make 7.2 surround sound system but, in order to get the maximum out of this system, you will need to play some Blu-ray disc with Dolby True HD or DTS HD audio track. Some of the latest Blu-ray movies feature Dolby Atmos or DTS:X audio tracks and, in order to hear that kind of surround sound properly, you are going to need one, two, or four height (or ceiling) speakers (which means that you have to expand surround sound system to 7.1.2, or 7.1.4). For most people, 5.1 configuration is more than enough. All the DVD and Blu-ray movies, as well as movies and series from Netflix and Hulu, have 5.1 surround sound track and you don’t really need more than that to get a truly immersive listening experience. Most of the wireless surround sound systems on our list are 5.1 and some of them can even simulate DTS:X or Dolby Atmos audio formats. As you might assume, simulation is never as good as the real thing, but still, something is better than nothing. Wireless surround sound systems have been introduced a few years ago and you can’t really expect them to be perfect. The quality of speakers (drivers) is not a problem but you might experience some transmission issues with some wireless systems (wired systems are more reliable). If you really want a perfect wireless surround system, you will definitely have to pay much more than you would pay for a wired surround sound system. If you compare two affordable (or cheap) systems within the same price range, you will definitely be happier with the sound coming from the wired one. If you are prepared to pay more than, let’s say $1000, the difference in sound quality (between wired and wireless) becomes less noticeable. So, basically, the fact that some surround system is wireless doesn’t have to mean that it’s not good (especially if you buy one of those high-end systems). There are two types of wireless surround sound systems – Bluetooth and Wi-Fi (some use your home Wi-Fi network, others make their own 5GHz network and don’t use your home Wi-Fi at all). Wi-Fi connection is, in general, more reliable and more expensive. Wi-Fi systems usually don’t feature Bluetooth so you can’t use them to stream music via Bluetooth from Bluetooth-enabled devices but most of them have their own apps and you can access some of the supported online streaming services through the app and stream the music that way (but you won’t be able to stream the music stored on your phone or PC). Wi-Fi systems also offer much greater range. So, if your home theater is in a large room, you will be better with a Wi-Fi surround sound. In terms of sound quality, Wi-Fi is definitely better than Bluetooth. Bluetooth audio has to be compressed prior to transmission which means that you are not getting Hi-Fi audio. Wi-Fi allows transmission without compression so you can expect much better sound quality. Bluetooth systems are usually easier to install than Wi-Fi systems and that’s probably their only advantage (except for the price). The majority of so-called wireless surround sound systems is not actually wireless. Most of them have the main unit (soundbar in most cases) that has to be connected to your TV through wires and it also has to be plugged into the wall outlet (SONOS and other Wi-Fi systems). This main unit receives the signal from the TV and then transmits it wirelessly to other speakers. All the other speakers also have to be plugged in so it’s hard to say that any of these ‘’wireless’’ surround sound systems are truly wireless. Bluetooth surround sound systems are even less wireless than Wi-Fi systems. Soundbars are always wired and they send the audio signal to other speakers (in some cases, you will only get a wireless (Bluetooth) subwoofer while you need to connect surround speakers to the subwoofer or to the soundbar through wires). So, all these systems are wireless in a sense that you can stream music wirelessly from all the supported devices (Bluetooth-enabled devices for Bluetooth surround sound system or Wi-Fi enabled devices using the same Wi-Fi home network for Wi-Fi surround sound system). These wireless systems will reduce the number of cables (since you don’t have to stretch cables across your room and connect each speaker to the receiver) but you can’t eliminate all the cables – they won’t magically disappear. We have decided to mention 2 additional wireless surround sound systems on top of those 10 on our list of best wireless surround sound systems. These two systems offer the greatest autonomy (in case you need your system to be as wireless as possible). The first one is Damson S Home Theater System (only subwoofer and soundbar have to be plugged in while the surround speakers are completely wireless and battery-powered) and the second one is ONEmicro 5.1 (all the speakers are wireless and only the subwoofer needs to be plugged in). If you decide to buy one of these two systems, you should be aware that you will have to make some compromises (especially when it comes to ONEmicro 5.1). To be more specific, you will have to sacrifice the sound quality in order to get more wire-free environment. That kind of compromise is inevitable at the moment but who knows what will happen in a year or two. In this article, we will be dealing with the systems that are slightly ”less wireless” than the previously mentioned ONEmicro5.1 and Damson S Home. Well, in the end, it’s all up to you but you should know a few important things. First of all, you can’t buy a decent wireless surround sound system for less than $300 (maybe $250) and that’s considered cheap when it comes to wireless surround sound. Most of those on our list of 10 best wireless surround sound systems cost more than $500, and some even more than $1,000 (or $1,500). Second, they are usually not as good as wired surround sound systems (in terms of performance, reliability, and sound quality) and you are basically paying more for the wireless transmission and convenience than for the sound. They are definitely not crappy but you can get similar performance for half the money if you decide to buy a wired system. Unfortunately, you will lose the convenience that comes with wireless technology. Third, most of the wireless surround sound systems are not completely wireless. In some cases, they need to be plugged into the wall outlet, in other cases, surround speakers have to be connected to the subwoofer. You will eliminate most of the audio cables (connecting the speakers to the receiver) but you will still have all those power cables and you will need a wall outlet for each of the speakers. Having all these downsides (price, reduction and not elimination of the cables) in mind, we still think that you should buy one of these wireless systems if you have that kind of money. If your floor is covered with cables and you cannot stand it anymore, eliminating those longest (speaker cables) going from your receiver to the surround or rear speakers will definitely make a difference. You can hide all those other cables behind your TV stand but it’s much harder to hide the speaker cables. The best solution is buying a wireless surround sound system. And if you go for one of those above $500 or $1000, you will be seriously amazed by the sound. Sonos is one of the leaders in the wireless audio industry. This is one of the first companies that came up with the idea of wireless (wi-fi) audio equipment and brought that idea to reality. SONOS is well-known for making wi-fi smart speakers and multiroom wireless speakers but they’ve decided to expand a little bit and start making home theater systems. They made a soundbar called PLAYBAR first and, after that, they decided to pair it with some of their other products. There is a lot of possible combinations – you can combine one PLAYBAR (or PLAYBASE, which is SONOS wireless sound base) with SONOS subwoofer (simply named SUB) and 2 speakers (either PLAY:1, PLAY:2, or PLAY:3) and make your own 5.1 surround sound system. The best thing is that you don’t have to buy all these speakers at once and splash more than $1,500. You can start with the PLAYBAR (which is the main unit and the one that connects wirelessly to other speakers) and then make upgrades. We have decided to present to you the combo PLAYBAR + SUB + 2xPLAY:1 but you can make your own combination (buy PLAYBASE instead of PLAYBAR, PLAY:3 or PLAY:5 instead of PLAY1). In our opinion, this is the best wireless surround sound system on the market. It offers great sound quality, it is really simple to install and use, and SONOS app works flawlessly (you have to use it to calibrate and control the surround sound system because there is no remote). The greatest flaws of this system are limited number of inputs (that’s an understatement since there are only one digital optical input and two Ethernet ports) and lack of support for DTS surround sound. Each piece of equipment comes in a separate box. Everything looks really premium and expensive – after all, it would be a surprise if that wasn’t the case considering the price of the system. PLAYBAR weighs almost 12 pounds, it’s 3.35 inches high, 35.43 inches wide, and 5.51 inches deep. Besides the PLAYBAR, you will get a power cord, digital optical cable, Ethernet cable, Quick start guide, and a warranty card. You have two options when it comes to PLAYBAR placement. You can mount it on the wall (wall mount kit is not included and you have to buy it separately – you can find PLAYBAR wall mount kit on Amazon for less than $40) or you can place it on your TV stand in front of your TV. It’s probably better to mount it on the wall – that way the drivers are facing toward you and make the soundstage much wider. SONOS tends to make simple and elegant audio equipment. PLAYBAR is a perfect example of that kind of approach. The front panel is completely covered with a black and soft grille made of acoustic fabric. The rest of the cabinet is made of hard plastic with a few metal elements. On the front panel, there is also IR sensor – PLAYBAR can learn commands from your TV remote or any universal remote so if you don’t want to use the app, you can use one of your remotes. There are 3 control buttons on the left side panel – play/pause (you can use it to mute the volume while watching TV), and two volume buttons. Between play/pause/mute button and volume controls, you will see a small LED status/mute indicator. Inside the PLAYBAR, there are 9 drivers arranged in a phased array. CENTER channel consists of 2 woofers and a tweeter between them, there are two woofers on the left and right side and two angled tweeters on each end of the cabinet. Each woofer has 2.5-inch diameter, and tweeters are a bit smaller (1.5-inch). You won’t find that many drivers on other soundbars and that’s one of the biggest advantages of the PLAYBAR itself. Even if you decide to buy PLAYBAR only, you will be impressed by the soundstage and perfectly clear sound. PLAYBAR alone offers much better experience than any TV. SUB also comes in the same type of package. It weighs 36.3 pounds and it is 15.3 inches high, 15.8 inches wide, and 6.2 inches deep. Its design is quite unusual – it has a hole in the middle and it’s black and glossy. It kind of stands out, since all the other speakers don’t have that shiny look. We would like it more without that gloss, but it’s just the matter of taste. Besides the SUB, you will get one power cable, a quick start guide, and a warranty card. You can place the SUB horizontally or vertically – both ways offer pretty much the same type of sound. On the SUB, you will find only one pairing button (press the button to pair it with the PLAYBAR) and LED status indicator. That’s all, no volume controls or anything else. You have to use SONOS app to adjust the amount of bass and volume of the SUB. Inside the SUB, there are two 6-inch oval drivers firing at each other with 2 class-D amplifiers (no info on amp output or max SPL). This kind of driver arrangement should cancel out all the cabinet vibrations. Bass ports are at the bottom. SUB can play sounds down to 25Hz. PLAY:1 speakers come in two separate boxes that look completely the same as the boxes for SUB and PLAYBAR (only smaller). Each PLAY:1 speaker weighs 4.08 pounds (they are pretty heavy for their size), they are 6.36 inches high, 4.69 inches wide, and 4.69 inches deep. In each box, you will find power and Ethernet cable, quick start guide, and warranty card. Speakers look really nice. You can choose between two options – white speakers with a metallic grille or black speakers with a graphite grille. The speakers can be wall-mounted or placed on speaker stands. Wall mounts and floor stands are not included and you can buy them on Amazon or order them from SONOS website. The control buttons are on the top panel. You will see volume controls, play/pause/mute button, and small LED status indicator. On the back panel, there’s one pairing button and power cable. Inside each PLAY:1 speaker, there are two drivers – one woofer and one tweeter with dedicated class-D amplifiers (just like BOSE, SONOS doesn’t provide any info on max SPL, amp output, frequency response, sound to noise ratio, etc.). You can control these speakers through the app, too. SONOS 5.1 is one of the best-looking wireless surround sound systems on the market. They look minimalistic and elegant. The only thing that really stands out is the SUB because of its shiny finish. We would prefer the look without that finish but that’s just our taste. And we would pick black speakers with graphite grille – it fits better with black SUB and black and silver PLAYBAR. Installing the system should not take more than half an hour. Physically connecting the soundbar to your TV takes a few seconds (but you need a TV with digital optical output). All the other adjustments are done through the app. When you’re done with pairing all the speakers into a system, you have to calibrate the system. That’s also done through the app. There a section called TRUEPLAY which is auto calibration tool. This tool uses mic on your iPhone to calibrate all the important sound-related characteristics and adjust the speakers. TRUEPLAY doesn’t work with Android devices and you are going to need an iPhone (or iPod) to calibrate the sound. SONOS 5.1 system supports Dolby Digital 5.1 surround sound and that’s pretty much it. None of the other 5.1 or 7.1 or object-based surround sound formats are supported. Luckily, most of today’s Blu-ray discs feature DD 5.1 soundtrack. You can stream music and podcasts from your phone to the SONOS 5.1 system but there’s a catch. You can do that only through SONOS app. SONOS app has a bunch of streaming apps like Deezer, Spotify, Google Play, iHeartRadio, etc. integrated and you will have to open the SONOS app, then go to the section with all these integrated streaming apps and stream the music. It doesn’t matter if you have some streaming app already installed on your phone – you have to open SONOS app and access the streaming app through SONOS app. There are two more additional features that you can activate through SONOS app – Speech Enhancement and Night Mode. You can use Speech Enhancement if you are hard of hearing or if you want to hear the vocals better. This thing really improves the intelligibility by making the voices louder and clearer and background sounds and music quieter. Night mode is something that you can use if you are watching TV or movies late at night. If you don’t want to wake up everybody, you just have to activate night mode and it will adjust the sound by making quiet sounds a bit louder and loud sounds quieter. You will hardly find some wireless surround sound system that’s so easy to use and install, that works flawlessly, and offers very good sound. SONOS 5.1 is the perfect combo of these three things. Some would say that Denon Heos AVR 5.1 Surround System is better when it comes to sound quality and that’s probably true but there are some functionality issues that make it really user-unfriendly. SONOS 5.1 doesn’t support DTS 5.1 surround sound audio format and that’s the greatest downside of this system. It also doesn’t support any 7.1 or object-based surround sound formats but that’s not such a big issue. Most Blu-ray discs have either DD 5.1 or DTS 5.1 audio track and if you get a disc with DTS 5.1, you won’t be able to play that surround soundtrack. SONOS PLAYBAR features only one INPUT port (digital optical) and there is not even one HDMI input. For some people that could be a huge deal breaker. You have to use all the streaming apps through the SONOS app and that’s a bit inconvenient. On the positive side, SONOS app does have more than 80 different streaming options. SONOS 5.1 system is slightly overpriced. PLAYBAR and PLAY:1 speakers are pretty good for the price, but SUB with 6-inch drivers should definitely cost less. You can find much better subwoofers for less than $700 but only SONOS SUB will work with SONOS PLAYBAR and if you are a fan of SONOS wireless audio, you won’t mind paying $100 more for SONOS 5.1 system. Nakamichi maybe sounds familiar to older audio enthusiasts. It was one of the biggest manufacturers of old-school cassette tape decks during the 1970s and 1980s. The company was founded in 1972 and during the first two decades it was one of the most popular audio brands. After the introduction of digital audio, Nakamichi wasn’t such a big name anymore. The company wasn’t shut down and they managed to survive by making car audio systems. In 2016, Nakamichi made a great comeback to the American market. A new branch of Nakamichi audio was opened in the US and their only area of expertise are home theater systems. Their first product was Nakamichi ShockWafe Pro 7.1 Bluetooth soundbar with a subwoofer and two rear speakers and it was a big success. After this one, they made three more systems – Nakamichi Pro 7.1 with DTS:X support, Elite 7.2 with DTS:X support, and Ultra 9.2 with DTS:X support. This review is dedicated to Nakamichi’s first soundbar, the one that brought Nakamichi back to the market. It’s called ShockWafe Pro 7.1 but it’s more like enhanced 5.1 surround sound system. 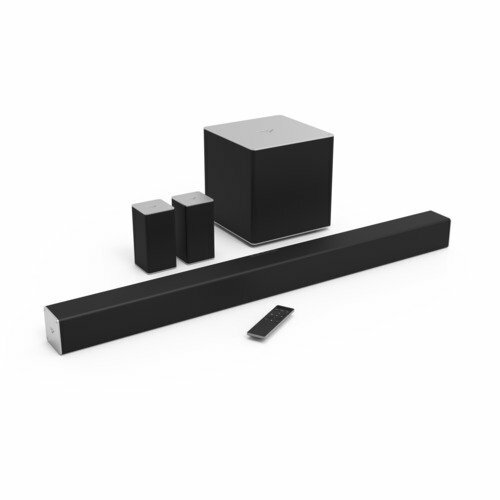 Some of the greatest things about this system are that it offers much more connection options than previously reviewed SONOS 5.1 system, installation is relatively simple, surround sound performance is pretty good, and the price is more than affordable. ShockWafe Pro 7.1 is one of the best wireless surround sound systems under $500. Have in mind that this is the entry-level wireless surround sound system and if you want improved model with DTS:X support you will have to pay $150 more while 9.2 model costs more than $1000. Greatest flaws of this system are lack of support for object-based surround sound audio and, in some cases, an unstable connection between the soundbar and subwoofer. All the pieces of ShockWafe Pro 7.1 come in one huge box. Each speaker is protected with Styrofoam and wrapped in plastic foil. Inside the big box, you’ll find another smaller one with all kinds of accessories. When it comes to accessories, Nakamichi was more generous than any other manufacturer of surround sound systems. Inside the big box, you will find Nakamichi Bluetooth soundbar, wireless subwoofer (also Bluetooth), two rear (or surround) speakers, and a remote with LCD display (+ 2 AAA batteries). In the accessory box you will find all the cables – subwoofer power cable, 2 26-inch long speaker cables (not regular speaker wire but proprietary), auxiliary cable, one HDMI cable, wall screws, wall brackets, mounting screws (for soundbar and speakers), wall mount brackets, and Velcro strips. Soundbar weighs 7.25 pounds, it is 45.5 inches long, 3.3 inches deep, and 3 inches high. It looks quite interesting and unusual with all those angular edges. Inside the soundbar, there are 6 2.5-inch woofers arranged in 3 groups (channels), so you have left, right, and center channel. Additionally, there are two 1-inch angled tweeters on both ends of the soundbar. The idea is to improve surround sound experience with these two surround effect tweeters. You will find 5 control buttons on the soundbar itself (power, source, DEMO, and Volume buttons) but you will have to use soundbar remote for most of the settings. You can also use TV remote if you want to turn on/off the unit or adjust the volume. On the front side of the soundbar, you will see black aluminum grille with 10 LED lights at the bottom. These ten indicators will show you which input is selected, which type of surround sound is being played, and many other things (you will see a different combination of LED lights flashing or glowing depending on the source, surround soundtrack, type of settings you are adjusting, etc.). You can’t really consider these LED indicators intuitive and you should look at the LCD display on your remote rather than LED indicators. All the connections are at the back – you will see two HDMI inputs with 4K pass (no HDCP 2.2 support), one HDMI ARC OUT for connecting your TV to the soundbar (if your TV has HDMI ARC IN port), one digital optical, one coaxial, and one 3.5mm input. There is also a USB port but it’s designed for firmware upgrades only. Soundbar also features Bluetooth 3.0 so you can pair any of your Bluetooth-enabled devices with it and stream music or podcasts. Subwoofer weighs 15.5 pounds, it’s 7.9 inches wide, 12.3 inches high, and 16.7 inches deep. It’s also interesting and unusual (shape-wise) and it looks good in combination with the soundbar. Inside the subwoofer, there is an 8-inch down-firing driver (you shouldn’t expect extremely deep lows). At the back of the subwoofer there is one pairing button with a blue LED indicator, power switch, AC input, and two output ports for surround speakers. Satellite (surround) speakers weigh 1.1 pound each, they are 4.3 inches wide, 6.7 inches high, and 3 inches deep. Unlike subwoofer, satellite speakers are wired and you have to connect them to the subwoofer (not to the soundbar) and that’s why Nakamichi recommends placing the subwoofer on the opposite side from your TV (next to your couch, near the rear wall of your room). Each speaker has 1 2.5-inch driver. They can be wall mounted or placed on floor stands (you will have to buy stands separately). Nakamichi ShockWafe 7.1 Pro is black, it’s quite stylish and just a little bit oddly shaped. The design is mostly a matter of taste and there is no universal beauty but we still think that most of you will like it. Connecting the soundbar to all of your audio sources, pairing it with the subwoofer, and connecting the speakers should take no more than 10 minutes. Mounting soundbar and surround speakers will take more, but you will spend most of the time adjusting the sound and getting used to controls, programming your TV remote to use it with the soundbar, checking different EQ modes, etc. There is no automatic calibration tool (mic or some app). There is recommended speaker layout in Nakamichi user manual, and you should try to place the speakers in accordance with this recommendation in order to get the most out of this system. The best thing about this system (besides the sound) is that you can connect all kinds of audio sources to the soundbar. This soundbar is basically a substitution for AV receiver, it saves space and makes things a lot simpler. You can connect your TV, gaming console, cable or satellite box, streaming device, your PC, and other devices to the soundbar and you can shift from one to another input with your remote. You can also connect any Bluetooth-enabled device to the system and stream any music from your phone, laptop, iPad, etc. The range is pretty much standard (approx. 30ft). The connection is stable and we didn’t experience any signal loss. If you change the input source, your device will be disconnected and when you switch to Bluetooth input, device and soundbar will pair automatically. You can’t pair two or more Bluetooth-enabled devices simultaneously to the soundbar. Shockwafe 7.1 Pro supports Dolby Digital 5.1 and DTS 5.1 surround sound formats. It doesn’t support any of 7.1 surround sound audio formats (DD TRUE HD or DTS HD Master Audio) nor object-based audio formats (Atmos or DTS:X). It can decode only 5.1 surround soundtracks so it’s probably not fair to advertise it as 7.1 system (if you consider those two small angled tweeters on both ends of the soundbar speakers, then you can say this is 7.1 but in reality, it is not – it’s 5.1). 7.1 Pro offers crisp clean sound with pretty good soundstage and nice separation between left and right channels. It delivers an immersive listening experience, especially when watching movies (music doesn’t sound that good – it is clean and pretty loud but you won’t get enough bass with that 8-inch subwoofer). The frequency response of the system spans from 35Hz to 22KHz, maximum SPL is 104dB, RMS power is 150W (peak – 400W). On top of all this, you can choose between 6 EQ modes (Movie, Music, Game, TV, Sports, and Night) or you can adjust bass and treble manually. You can also adjust the volume of each channel or turn off surround speakers. First of all, we were not completely happy with the bass. It’s ok, but nothing more than that. It’s not punchy enough and it sounds a bit distorted at high volumes. Subwoofer pairs with the soundbar wirelessly through Bluetooth, but the connection is not excellent. It happens occasionally that subwoofer simply stops working (and when subwoofer stops, surround speakers also stop) and then you have to restart them and pair them again. There is no support for Dolby True HD, Dolby Atmos, DTS HD master audio, or DTS:X and some customers might see that as a deal breaker. Also, you will have only 2 HDMI inputs at your disposal and some of you might find that insufficient. Enclave audio is a small startup company established in 2013. It’s one of the youngest on the market and their first product CineHome HD 5.1 wireless surround system (or rather wireless home theater system in a box) was a great success. People from Enclave Audio tried to make the installation process as well as use as simple as possible and they really did it. This is the simplest system you can find. Unlike other manufacturers, Enclave decided to make a traditional 5.1 system (5 speakers – Front Left, Front Right, Center, Surround Left and Surround Right + 1 subwoofer). Most other wireless surround sound systems on the market include one soundbar combined with 2 speakers (surrounds) and subwoofer or, in some cases, one soundbar and subwoofer. So, you might even say that this is one of only a few wireless surround systems on the market that offer true 5.1 surround sound experience while others just imitate (simulate) surround sound. 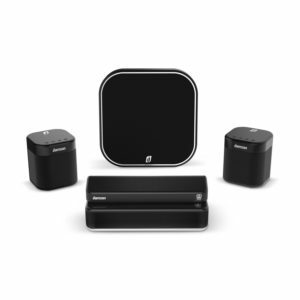 In some aspects, this system can even beat SONOS 5.1 system. Enclave Audio CineHome 5.1 features support for DTS 5.1 and Dolby Digital 5.1 (along with Dolby Pro Logic II) while SONOS supports only Dolby Digital 5.1. They both have good stereo separation and wide soundstage and it’s hard to say which one is better in terms of sound quality but we definitely prefer Enclave – it’s so much cheaper (less than $1000), offers similar surround sound experience, it’s easier to install and use, and have 3 HDMI inputs and one HDMI ARC output (while SONOS 5.1 has only one digital optical input). One thing where SONOS really excels is the app. Enclave Audio also comes with the Enclave Audio app, but SONOS app is definitely much more user-friendly and offers more control over the system. But we can live with that. Each speaker is separately packed in its own box and then put together in one huge package. This package weighs almost 65 pounds and you might need some help to lift it. Inside the box, you will find six smaller ones, each with a speaker inside (FL, FR, C, SL, SL, SR). You will also get a remote (which is probably the weakest link of this system but we will elaborate on that), one HDMI cable (you will need 3 more if you want to connect external audio sources – satellite or cable box, streaming box, gaming console, etc. ), and power cables for all the speakers. The main unit of this surround sound system is the center speaker (or Enclave Smart Center Channel). This speaker is not only a speaker but it acts as the hub of your home theater system (as you already know, every wireless surround sound system has the main unit and it’s usually the soundbar – that was the case with SONOS 5.1, with Nakamichi Shockwafe 7.1 and with many others). Smart Center Channel is 12.4 inches wide, 5 inches high, and 7.7 inches deep. It’s black, made of hard plastic, and the front side is covered with a grille made of soft acoustic fabric. There is a control center on the top panel that looks almost exactly the same as the remote (power, input, menu, mute, and OK buttons, two buttons for toggling through the menu and Volume controls). All the input and output ports are at the back. You will see 1 HDMI ARC output (for connecting your TV), 2 HDMI 1.4 inputs (not 2.0 and it’s not compliant with HDCP 2.2 so you can’t pass 4K Ultra-HD only regular 4K), digital optical input, auxiliary input, LED indicator, and DC input for the power cable. FL and FR speakers are 4.7 inches wide, 12.4 inches high, and 7.7 inches deep (each of them weighs 5.5 pounds). Front speakers can be placed on your TV stand, mounted on the wall or on floor stands (you have to buy wall mount kit and/or floor stands separately). SL and SR speakers are angled and each speaker features two drivers spreading the sound in opposite directions for better surround sound experience. These two units are the smallest of all the speakers – they are 8.1 inches wide, 5 inches high, and 4.3 inches deep. They can also be mounted on floor stands. The Subwoofer is quite large. It’s 17.7 inches high, 12 inches wide, and 13 inches deep and it can produce an incredible amount of bass, at least for a wireless system. Enclave Audio is probably the best wireless surround sound system when it comes to bass response. Along with all the speakers, you will get a remote. It’s incredibly simple with only 5 buttons and it looks cheap and really fragile. Each speaker has a built-in amplifier and wireless receiver and there are 14 drivers in total in these 6 units. Enclave Audio didn’t provide any info on the size of drivers, their frequency response, THD, or any other audio parameter, so it’s highly recommended to test this system (if you have the chance) before buying it and see if you like the sound or not. We were truly impressed. There is nothing special about this speaker system in terms of design. They are simple, even minimalistic. But still, elegant and visually appealing. One of the things that define this surround system is EASE OF USE (that’s right, all caps). The setup procedure is incredibly simple. It’s practically plug-and-play system. You just have to take the speakers out of the box, place them (they have labels at the back FL, FR, C, SL, SR so you can’t make a mistake), plug them all in (each power cable is 9 inches long), and press the power button. They will pair with each other automatically so you don’t really have to do anything. That’s why this system is WiSA certified (we are going to talk about WiSA certification later). Pairing will take around 30 seconds and after that, you can use the system. Enclave Audio CineHome HD 5.1 works on 5 GHz frequencies (5.2GHz to 5.8GHz) and it’s designed to avoid any interference with your home wi-fi network. That’s another plus for Enclave Audio. You can use on-screen menu to adjust the volume of each unit, chose the surround sound mode, adjust Dolby Prologic II, change Bluetooth settings (turn on/off auto pairing). The problem is that you can see this menu only if you connect the center channel to your TV through HDMI ARC. If you decide to use digital optical cable, you won’t be able to see the menu. CineHome HD 5.1 features Bluetooth and you can pair any of your Bluetooth-enabled devices with the system and stream the music. The connection is stable and we haven’t experienced any signal loss. The range is 30ft. You can also stream the music through the Enclave Audio app (available for Android and iOS). You can access some popular streaming services like SoundCloud, Tidal, TuneIn, Spotify through the app and stream music and podcasts that way, too. We are very happy with functionality and performance of the system. Thanks to the fact that you don’t have to use speaker wires, you can place FL and FR speakers far from each other and get incredible stereo separation and really nice sound image. The subwoofer will shake the floor, it’s that strong. Combine all that with perfect surround speakers, and you will get incredibly immersive surround sound experience that only TRUE 5.1 surround sound system can offer. The system supports both Dolby 5.1 and DTS 5.1 (as well as Dolby Digital Plus and Dolby Prologic II, HDMI 3D and 4K pass through). It doesn’t support Dolby True HD and DTS HD Master Audio or object-based Atmos or DTS:X (all these formats require bigger surround sound system 7.1 or 5.1.4). All in all, this is one of the best wireless surround sound systems we’ve tested and maybe the only one with true 5.1 sound. It’s also one of the cheapest wireless surround sound systems on the market and probably the leader when it comes to price/quality ratio. Great value for the money, that’s our verdict. First of all, Enclave Audio CineHome HD 5.1 is not HDCP 2.2 compliant and you won’t be able to watch Ultra-HD 4K video, unless you try to downgrade 2.2 videos to 1.4 or avoid connecting your cable box (satellite box) or streaming box to Enclave Audio (connect it to your TV if it supports HDCP 2.2) and then send audio from your TV to the central speaker via digital optical cable. If you connect your TV and the center speaker through an optical cable, you won’t be able to see the menu and you need to see that on-screen menu in order to choose different inputs, activate Bluetooth, change the volume of different channels, access Dolby Dynamic Range EQ settings, etc. There is no LCD menu on the center speaker or on the remote. So, if you want to see the menu, you have to use HDMI ARC connection (check if your TV features HDMI ARC before buying the system). If your TV has HDMI ARC port, there will be no problems at all. There is one more thing we have to mention. The remote really needs an upgrade. It looks cheap and poorly designed. The buttons are unresponsive. The good news is that Enclave Audio is already working on the upgrade. JBL is one of those big players that like to be competitive in every field of the audio industry. They are already famous for making portable wireless (Bluetooth) speakers like Flip, Charge, Xtreme, Pulse. But, this is not their only area of expertise, they also make all kinds of home and car audio, headphones, etc. JBL Bar 5.1 is their 5.1 wireless surround sound system but it can be also considered a home theater in a box since it has a bunch of inputs and it doesn’t require AV receiver. It’s not the best surround sound system on the market but considering the price (the whole system costs less than $700), it’s safe to say that you will get a good value for money. The soundbar is 45 inches wide, 2.3 inches high, 3.7 inches deep, and it weighs 8.6 pounds. It features 6 2.5-inch woofers and 3 1.25-inch tweeters. Soundbar’s peak output power is 150W. There is no info on RMS power. The soundbar is well-built. It’s mostly made of hard plastic but it looks quite strong. The front and top panels are covered with an aluminum grille. On the front panel, there is JBL logo in the middle and a small LCD status display just behind the grille (it will show you the selected source, volume levels, activated mode, etc.). On the top panel, there are 4 control buttons – power, 2 volume buttons, and source button. All the connection ports are at the back. You will see one HDMI ARC output (for connecting the soundbar to your TV), 3 HDMI inputs (HDCP 2.2 compliant), one digital optical input, one AUX input, USB 2.0 port (for audio playback (mp3 and WAV files) and firmware updates), and DC input. The subwoofer is 16 inches wide, 12 inches high, 12 inches deep, and it weighs 28.7 pounds. It has one 10-inch down-firing driver and a huge bass port at the back. It looks massive and it can really shake your floor. The subwoofer is wireless and it pairs with the soundbar automatically when you turn them on. Wireless connection works on 5.8GHz frequency. Subwoofer’s maximum power output is rated at 300W (peak power). Detachable surround speakers are 6.5 inches wide, 2.3 inches high, and 3.7 inches deep, and it each speaker weighs 1.3 pounds. These speakers are battery powered. Battery lasts up to 10 hours at 50% volume. Recharge takes up to 3 hours and in order to charge them, you have to attach them to the soundbar again. They don’t have their own proprietary power cables and they are only battery-powered so you will have to pay attention to the battery status (blinking red LED light indicates low battery). Maximum output power (not RMS) of the system is 510W, and frequency response of the system spans from 35Hz to 20KHz. Remote that comes with the system has an LCD screen – it looks quite nice and it’s really useful. You can use it to adjust all kinds of settings. You can use your TV remote to control the basic things (volume up or down, mute, power on/off). Most of the TV remotes made by Sony, Samsung, VIZIO, or LG will work without programming (the moment you turn the system on, you can control some basic things) and there is also IR remote learning procedure in case your TV remote doesn’t work with JBL soundbar right out of the box. The system is nicely made. It’s not flashy or shiny, it looks simple and stylish. It is not really small so you will have to pay attention to the dimensions. Everything is made of hard plastic. Installation is quite simple. After you set up everything and charge the surround speakers, you can take them out, place them behind or next to your listening position (they can also be mounted but you don’t have to do that) turn on soundbar, subwoofer, and speakers, wait a minute or less until the subwoofer and speakers pair with the soundbar. Then, you have to connect the calibration mic and place it at your listening position (at ear-level if possible), press the calibration button on the remote and wait until you see DONE sign on the LED display and you can start using the system. You can use your TV remote to adjust the volume or mute the system (works with most of LG, Samsung, Sony, and VIZIO TV remotes). But, if you want to make some advanced adjustments, you will have to use JBL remote. JBL remote allows you to control the master volume or control the volume of each channel separately. You can use dim display button to set display brightness or turn it off. You can also choose between different EQ modes depending on what you are watching at the moment (available EQ modes – Standard, movie, music, voice, sports). Remote also features Audio Sync buttons (+ and -). You can use it to make better synchronization if audio and video are not synced. The system goes into Standby mode after 10min of inactivity and it will turn on automatically when you turn on the TV or when some other sound source sends audio signal. JBL 5.1 also features Night mode which works basically the same as Night mode on SONOS device. It offers similar performance and works in the same manner – lowers all the loud sounds and enhances dialogues and quiet sounds. Night mode works only with DTS 5.1 and Dolby Digital 5.1. DTS 5.1. Dolby Digital 5.1, Dolby Audio, and Prologic, are supported formats. Dolby 7.1, DTS 7.1 or object-based surround sound audio formats are not supported. The soundbar also features Bluetooth 4.2 so you can use it to pair any Bluetooth-enabled device with the soundbar and stream anything you want. Bluetooth range is 33ft and connection is stable. The pairing process is pretty much standard, nothing unusual about that. One interesting additional function is SoundShift. When turned on (you just have to press the button on JBL remote) you can shift between Bluetooth and previous audio source without using the remote. The moment you disconnect your device, the soundbar will go back to the previous audio source. You have to activate SoundShift since it’s disabled by default. JBL 5.1 has an interesting sound signature. The accent is on bass and it rumbles all the time. Incredibly strong bass is the greatest feature of the system. All in all, this is a pretty good system. It performs better than expected and it is definitely worth the money. There is one issue we would like to mention but it’s not something that you can’t solve in a second. Mids and vocals don’t sound crisp and clean if your subwoofer volume is set too high. Bass is simply too strong for the rest of the system and all the other sounds get overwhelmed by the bass. Lower the bass volume and you will get much better sound. Even if your subwoofer volume is at 20%, you will get pretty decent surround sound experience. VIZIO is one of those manufacturers that make affordable audio equipment. They have become famous for making TVs but they also make all kinds of electronic devices including soundbars and surround sound systems. VIZIO products are not cheap but they are not expensive either. Most of their surround sound systems are mid-range products and prices and performance prove that. We have decided to present to you one of VIZIO’s older surround sound systems from 2013. 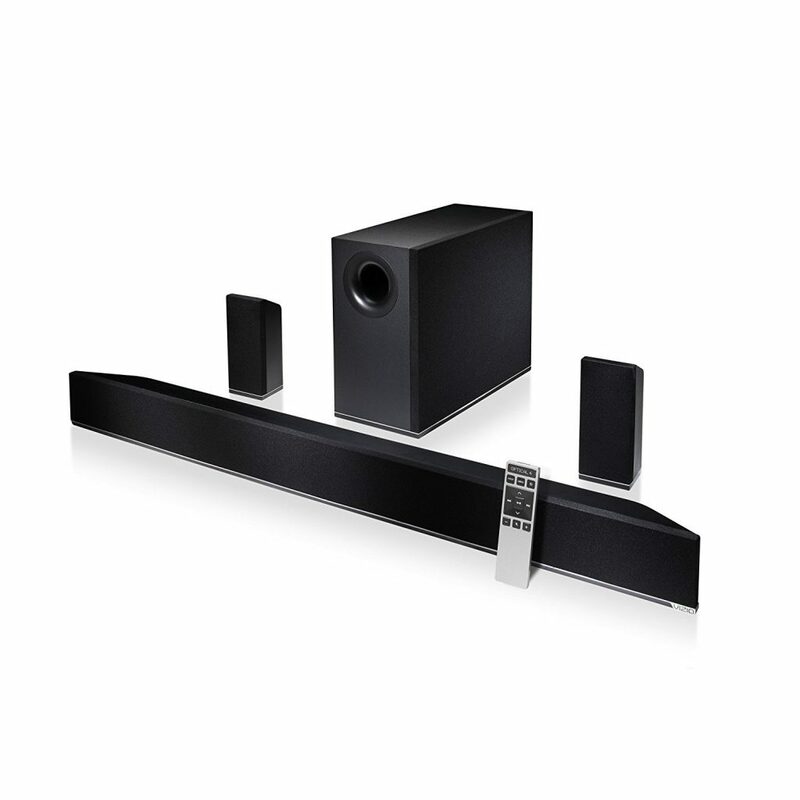 S4251w-B4 is a system made of one 42-inch soundbar, one wireless subwoofer, and two surround speakers. It’s definitely much cheaper than high-end wireless systems made by SONOS or DENON. This is another surround sound system that can be considered good for the price. VIZIO S4251w-B4 comes in a large 33-pound box. Inside the box, you will find all the things you need – soundbar, subwoofer, two surround sound speakers, remote (with batteries), digital optical and coaxial cable, RCA to 3.5mm audio cable, auxiliary cable, 12ft long proprietary speaker cables, wall mounting kit (mounting brackets for soundbar and surround speakers, screws, wall mount template, Velcro cable ties, and cable management tie), a quick start guide, and 1-year warranty card. The soundbar is 42 inches wide, 3.74 inches high, 3.15 inches deep, and it weighs 9 pounds. It features 8 drivers arranged in 3 channels. Center channel consists of two 2.5-inch full-range drivers and left and right channels consist of two 3-inch mid-range woofers combined with one 0.75-inch tweeter. Everything is completely made of plastic. All the drivers are protected with a soft and spongy grille. In the left corner, there are ten LED status indicators. You won’t find any sign or label next to these LED lights and you will need to consult user manual in order to understand the meaning of different combinations of LED lights. Buttons are located on the left end of the soundbar. They are also not marked – the only thing you will see are simple black clickable buttons that look the same. The first one is power, the second is input, then goes Bluetooth button and two volume buttons. You will have to remember this arrangement or to read the page 6 of your quick start guide. All the inputs are on the rear panel. There are 5 input ports in total – digital optical and coaxial, one 3.5mm, one RCA, one USB 2.0 port (plays only WAV files). As you can see, there is no HDMI. The subwoofer is 12.5 inches high, 6.9 inches wide, 15.9 inches deep, and it weighs 14.7 pounds. It features one 6.5-inch driver that can play sounds down to 40Hz. The sub is wireless and it connects automatically to the soundbar through Bluetooth. Advertised range is 60 feet, but we recommend keeping the subwoofer within 20-30ft range. The subwoofer is completely black and made of hard plastic. You will see the bass reflex port on the front side and all the connections and controls are at the back (power input, power switch, pairing button with one LED indicator, and two surround speaker outputs with built-in amplifiers). Surround speakers should be connected to the subwoofer and it’s recommended to place the subwoofer next to your couch and stretch the cables from there to your surround speakers. Surround speakers are 7.42 inches high, 3.18 inches wide, and 2.8 inches deep. Each surround speaker has one 2.5-inch full-range driver. Along with the speaker system, you will get a remote with LCD display. This remote seems extremely simple but it is definitely not. There are 3 pages of different button combinations that you have to press to do some advanced settings. Better remote is something this system truly needs. Remote has only 13 buttons (Input, Menu, Power, Volume Controls, Mute, Play/Pause/Enter, Up and Down Arrows, Previous and Next buttons) and LCD display. VIZIO 5.1 S4251w-B4 looks visually pleasing. It’s not the most beautiful out there, but it’s simple and inconspicuous (it doesn’t stand out too much). It’s made of plastic that feels a bit thinner than we would like it to be. The installation process was simple and quick. After placing all the speakers and connecting surround speakers to the subwoofer (if you decide to mount soundbar and speakers, it will take more time), power on soundbar and subwoofer, they will connect automatically (if they don’t, press pairing button on the subwoofer for five seconds and then press the power button on the soundbar for five seconds). After pairing, you can use the system. There is no automatic calibration tool (like microphone or app) and you will have to go through all the settings (bass level, surround level, soundbar level) and adjust everything to your needs. The system supports Dolby Digital 5.1 and DTS 5.1. All the other 7.1 and object-based surround sound formats are not supported (there is no simulation for those surround sound audio formats). The system also features Bluetooth. Pairing is simple but it takes some time. In our case, we had to repeat the process twice in order to pair iPhone 6 with the soundbar. The soundbar will pair automatically with the last paired device. There’s also the function called TruVolume that you can activate with your remote. This function levels the volume of different scenes and makes your listening experience better or ‘’more enjoyable’’ as the manufacturer says. But, the thing is that you don’t really want this function enabled when watching a movie if you want to be immersed in it. You might want it enabled while watching movies late at night but for that you also have Night Mode function. VIZIO S4251w-B4 surround sound system supports Dolby Digital 5.1 and DTS 5.1. It doesn’t feature support for 7.1 or object-based surround sound audio tracks. This system doesn’t offer the greatest surround sound experience. It’s good enough for smaller or mid-sized rooms and it does have wide soundstage with decent stereo separation but there is noticeable distortion when the volume is above 80%. All in all, this system offers good value for money and if you are on a budget, this might be one of the best options. VIZIO S4251w-B4 doesn’t have any HDMI inputs. This could be a huge deal breaker for many people and you should be aware of this thing. This surround system is definitely a better option than a simple soundbar but the sound is still tiny. The 6-inch bass driver won’t shake your floor and it’s definitely not as punchy as some previous subwoofers on the list but it adds a certain amount of depth to the sound and it makes surround sound experience better. VIZIO S4251w-B4 is not the best wireless surround sound system but it is much better than TV speakers or any soundbar on the market. Some customers complained about the subwoofer. The problem was that it resets to max volume whenever you turn the system off so when you turn it back on you get almost deafening sound coming from the subwoofer and you have to reduce the volume of the subwoofer immediately. Some people complained about the volume fading in and out while watching a movie but this only means that TruVolume function is enabled and you have to disable it. When Eco Power mode (power saving mode) is enabled the main unit shuts down too quickly. It could even turn off during a movie if there’s a long quiet part. Yamaha is one of the most respected names when it comes to home theaters and home audio equipment. YAS-207BL is Yamaha’s first soundbar/subwoofer wireless surround sound system that supports DTS:X object-based surround sound audio tracks. This is one of the cheapest systems on this list and that’s probably because it’s not true 5.1 but it simulates surround sound and it also simulates DTS:X object-based surround sound (Atmos is not supported). Inside a large 29-pound box, you will find the main unit (YAS-CU207), the subwoofer (NS-WSW42), remote, two power cables, digital optical cable, mounting template (no wall mount kit – you have to buy it separately), user manual, and 1-year warranty. The soundbar is 36.6 inches wide, 2.4 inches high, 4.25 inches deep, and it weighs 6 pounds. It is slim and sleek, it looks very stylish. The front panel and left and right ends are wrapped in traditional fabric grille. On the front panel there’s a small silver strip at the bottom with Yamaha logo on the left side and 9 LED indicators in the middle – DD (green) or DTS (red), DPL (lights up when Dolby Pro Logic is activated), HDMI, TV (digital optical), Analog (AUX input), Bluetooth, Surround, Bass Extension, and Clear Voice. On the right end, there are 5 touch sensitive buttons – Input selection, mute, volume controls, and power button. On the rear panel, you will find all the connections – AC input, one HDMI input, one HDMI ARC OUT, AUX input, digital optical input, and micro USB port (for updates only). The soundbar can be mounted on your wall or you can simply place it on your TV stand, in front of your TV. You have to buy screws and everything else if you decide to mount it on the wall. Inside the soundbar, there are four 1.75-inch woofers (frequency response spanning from 180Hz to 23KHz) and two 1-inch tweeters (frequency response spanning from 7KHz to 23KHz), The maximum output power of the soundbar 100W. The subwoofer is 7.1 inches wide, 17.25 inches high, 15.75 inches deep, and it weighs17.4 pounds. It’s completely black and it’s made of hard plastic. On the front panel, there is only one bass reflex port. On the rear panel, you will find a pairing button, standby LED indicator, connection indicator, and AC input. Inside the subwoofer, there is one 6.25-inch cone driver with bass reflex port. The frequency response of the subwoofer spans from 40Hz to 180Hz. The remote that comes with the system looks nice and stylish. Even more important, it’s functional and you can use it to adjust all kinds of settings There are 16 buttons on the remote – power button, input source buttons (HDMI, TV (digital optical), Analog, Bluetooth), Surround and Stereo buttons, Clear Voice, Bass Extension, Bluetooth Standby, Dimmer, Subwoofer + and -, Volume + and -, and mute button. YAS-207BL is beautifully designed system. The soundbar is slim and it won’t block you TV if you decide to place it on your TV stand. The subwoofer is not too large and it won’t take too much space if you have a small room. The installation process is very simple and it takes only a few minutes (if you don’t want to mount it). All the LED indicators should face toward the viewing position. This soundbar doesn’t have up-firing drivers like some other DTS:X enabled soundbars. Controlling the unit is very simple and easy. You can do everything with your soundbar remote or you can use your TV remote to power on/off the system, chose the input, adjust the volume, and change audio output device (choose between TV and unit). You can do all this only if you use HDMI ARC connection and if HDMI control function on your TV is enabled. Also, you can install Home Theater Controller application for Android or iOS and control the system with this app. The system supports Dolby Digital 5.1 and DTS 5.1 surround sound as well as PCM. This unit can also pass through 4K video and it features support for HDR and HDCP 2.2. DTS:X 3D surround simulation is supported but you have to install the firmware update. By pressing surround button on your remote you will shift between different surround modes. When surround sound LED (the one with DD/DTS label) glows green you’re getting regular surround, blue is 3D surround (or DTS:X), when there is no light, you are in stereo. DPL LED with glow when stereo sound is played in surround mode (Dolby Pro Logic is activated). The unit features Bluetooth 4.1. You can pair any Bluetooth enabled device with the system but you cannot pair two at the same time. The system will pair with the last Bluetooth device automatically when you press the Bluetooth button on your remote. You can also activate Bluetooth standby mode by pressing Bluetooth Standby button on the remote. When this mode is enabled, you can use your Bluetooth-enabled device to turn on/off the unit. This system features some nice additional functions like bass extension, clear voice, and dimmer. Bass Extension improves bass response just a little bit and makes it punchier but, to be honest, it doesn’t make a great difference and it causes mid-range frequencies to sound muddier than in standard mode. Clear Voice mode will push forward certain frequencies and make dialogues much better and more intelligible than standard settings. Dimmer button allows you to adjust the brightness or completely turn off LED indicators on the main unit. Auto power (standby) function is disabled by default (for US market). When this function is enabled, the system will turn off after 8 hours of inactivity or after 20 minutes without an input signal. For a $300 price, YAS-207BL is very good surround sound system. It’s probably more appropriate for small and mid-sized rooms. The subwoofer is not too large but it’s punchy and fast. Compared to other soundbars within the same price range it does offer a bit wider soundstage (not like some true 5.1 systems but still decent). As far as Virtual:X surround sound is concerned don’t expect too much. You won’t get perfect vertical audio experience but that’s pretty much what you get from any soundbar that imitates (simulates) object-based surround sound. As you could see, the number of inputs is very limited – there are only one HDMI input and one HDMI output. If you need more inputs, you should buy some other wireless surround sound system. Yamaha basically expects you to use your TV as a hub and connect all of your devices (or most of them) to your TV and then connect the TV and soundbar via HDMI. Yamaha also recommends connecting gaming console to AUX input, but we all know that’s not the right way if you want surround sound experience. Here’s one more VIZIO product. It’s slightly improved version of the previous S4251w-B4 5.1 wireless surround system. Some issues and things we don’t like are still there but there are also some noticeable enhancements like 2 HDMI ports (one IN and one ARC OUT), better build quality (they decided to use aluminum instead of plastic for some parts), and better sound quality (especially the sound coming from the soundbar). Inside a large 31-pound box you will find your VIZIO SB4051-CO soundbar, a wireless subwoofer, satellite speakers, remote (batteries included), a set of cables (RCA to 3.5mm, AUX cable, coaxial, optical, one HDMI cable, proprietary speaker cables), wall mount kit (brackets for surround speakers and soundbar, screws, mounting templates), a quick start guide, and 1-year warranty card. Soundbar weighs 7.5 pounds, it is 40 inches wide, 3 inches high, and 3 inches deep. It looks more premium than older VIZIO models. The front and top panels are covered with black aluminum grille, and there are aluminum caps with VIZIO logo on each end of the soundbar. In the left corner, behind the grille, there are 9 LED indicators arranged in a vertical line. This is not a great change compared to LED indicators arranged horizontally on older models. LED indicators are not more intuitive, and you will still have to read the manual to understand the meaning of different combinations of LED indicators (and different combinations will appear when you are trying to pair some Bluetooth device, adjust bass, treble, center, or surround levels, turn on or off surround sound, night mode, DTS TruVolume, adjust audio delay, enable VIZIO TV remote or program your TV remote made by some other manufacturers, etc.). VIZIO really needs to improve these LED indicators or even add a backlit LCD display. Control buttons are on the top panel. There are 5 buttons – power button, input button, Bluetooth button, and volume controls (- and +). Rear panel is made of plastic and you will find all the inputs and outputs on it – power input, one auxiliary (3.5mm) input, one RCA input, optical and coaxial inputs, one HDMI input, USB input (not very useful – plays only WAV audio files), and one HDMI ARC out. So, the greatest improvement is that you have two HDMI ports (some people might still think it’s not enough). It’s recommended to use HDMI ARC OUT to connect the soundbar to your TV (if your TV has HDMI ARC IN) and use other HDMI input port to connect your Blu-ray player or Cable/Satellite box. Inside the soundbar, there are three full-range 2.75-inch drivers, one for each channel (Front Left, Center, Front Right). The frequency response of the left and right channels spans from 90Hz to 20KHz, and the center channel is adjusted for dialogues (160Hz to 20KHz). The subwoofer weighs 12.5 pounds, it is 9.65 inches wide, 10 inches high, and 9.65 inches deep. It’s all-black with an interesting aluminum panel with VIZIO logo on top. On the rear panel, you will find a pairing button, LED connection indicator, two output ports for speakers, power input, and power switch. There is one 6-inch down-firing driver inside the subwoofer with a bass reflex port at the back. The frequency response of the subwoofer spans from 50Hz to 90 Hz. You can conclude, even without listening to this sub, that you won’t get a great amount of bass and that it won’t be perfect. Surround speakers have aluminum caps on top, all the sides are black with aluminum grille protecting the drivers. The rear panels are plastic with speaker cable input ports. There is one 2.5-inch full-range driver inside each speaker. Remote that you get with VIZIO SB4051-CO is absolutely the same as the one you get with the previously mentioned VIZIO S4251w-B4 surround sound system. In fact, you will get the same remote with every VIZIO soundbar and surround sound (soundbar) system. The remote is very simple, there are 11 buttons and LCD display. In terms of design, VIZIO SB4051-CO looks more premium than previous VIZIO models but it is not the greatest surround sound system on the market. Anyway, it looks nicer than many models within the same price range. It’s also built better – aluminum grille and other details made of aluminum make it look strong but we can’t really confirm that it will last much longer than older VIZIO models. Installation went smoothly. If your TV doesn’t have HDMI ARC input, you can use digital optical cable. Controlling the system and using the remote is also quite easy but you will have to consult the manual if you need to make some advanced adjustments. You can use soundbar remote to adjust the volume of each channel, but you can also adjust the amount of bass and treble. You can also use your TV remote for some basic settings (adjust system volume, power on/off). Some VIZIO TV remotes don’t require programming but if you have some other TV remote, you will have to program it. VIZIO SB4051-CO supports PCM, Dolby Digital 5.1 and DTS 5.1. Other 7.1 and object-based surround sound formats are not supported. This system features Bluetooth with aptX low latency. Pairing is simple but the connection is not so great. Advertised Bluetooth range is pretty much standard (33ft) but it’s shorter than that in reality. Just like previously reviewed S4251w-B4, this system features DTS TruVolume, Night Mode, and Eco mode. TruVolume levels the sound and offers better listening experience (but we prefer the sound with TruVolume off). Night Mode lowers the amount of bass and this is something you’re going to need (we will elaborate on this later). Eco mode is the most annoying. In theory, it’s nice and useful feature and it saves you some money by lowering power consumption, but it powers off the unit if there is no input signal for a few minutes or even quicker – this feature is definitely not programmed appropriately and some firmware update should solve this issue. When it comes to sound quality, we can’t complain too much considering the price. This unit is definitely much better for movies than for music and if you are into music or audio enthusiast, you won’t be happy with it. Bass is really big part of the sound signature of VIZIO SB4051-CO but it is often too ‘’boomy’’ and practically unbearable. Mids and highs sound much better if the bass (bass level and bass volume) is set to minimum. Connection issues – Soundbar and subwoofer have to be in the line of sight if you want constant playback without signal loss. This is a really big issue and you will have to think about subwoofer placement – you can’t put it behind your couch. LCD display on the remote is not backlit and if you are watching a movie at night (all the lights are off), and you want to increase the volume or lower the bass level, you won’t be able to see anything. You will experience sound delays and lip sync issues occasionally but there is AV Delay feature and you can adjust the sound and get better synchronization. The system is slow sometimes. It needs time (a few seconds) to shift between different inputs and you will have to be patient and wait. The subwoofer is way too ‘’boomy’’ and it muddies the midrange at high volumes. This is so annoying that it can ruin your listening experience. Bass simply overpowers everything and kills all the clarity. Even at low volumes, bass can kill the joy. The best possible solution is to enable Night mode. It will lower the bass significantly and make a better balance between lows, mids, and highs. Sony is one of the companies that have been an integral part of the audio and electronics industry for decades. Their home theater systems, AV receivers, surround sound systems, TVs, and other audio and video equipment are very popular among all kinds of customers (regular, audio enthusiast, professionals, etc.). 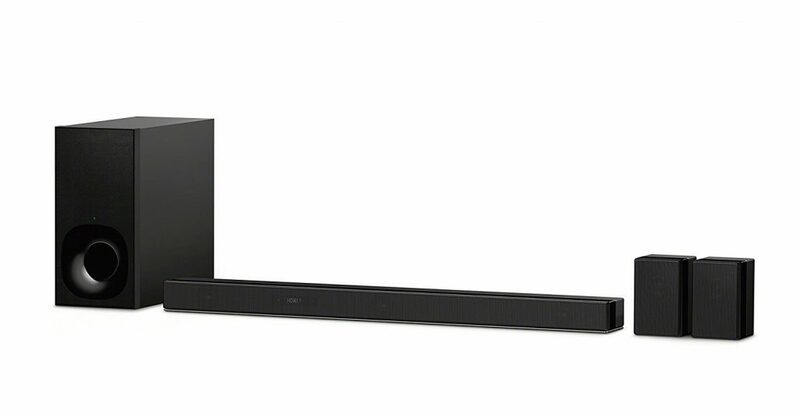 We’ve decided to present to you one of Sony’s latest products Sony HT-Z9F 3.1 soundbar system combined with 2 rear wireless speakers. You don’t have to buy these rear speakers – soundbar and subwoofer are available for less than $900 but you will get so much better surround sound experience for additional $300. They really make a difference. HT-Z9F offers support for 4K HDR video and all the surround sound audio formats (for devices connected through HDMI input ports) including Dolby Atmos and DTS:X object-based surround sound. Thanks to this new technology called Vertical Surround Engine, this soundbar system with only 3 front speakers (no up-firing speakers) is able to simulate 7.1.2 surround sound and give the 3rd (vertical) dimension to the sound. Inside large premium-looking box, you will find your Z9F soundbar, wireless subwoofer, remote (batteries provided), magnetic speaker grille, one HDMI cable (there are three HDMI ports and you will have to buy two HDMI cables separately), wall mounts, wall mount template, operating instructions, startup guide, Dolby Demo Disc (which is a nice detail), and a warranty card. Soundbar weighs 6.8 pounds, it’s 39.4 inches wide, 2.6 inches high, and 4 inches deep. Inside the soundbar, there are 3 1.8-inch full-range cone woofers rated at 35W per channel. Between Left and Center channel, there is a Bluetooth indicator (lights blue when connected), a small display, and a remote-control sensor. Controls are located on top. There are 6 touch sensitive buttons – power, input selection, Bluetooth, Music Service (you have to install the software update to make it work), and 2 volume buttons (+ and -). Inputs and outputs are on the rear panel. You will see two HDMI inputs (with HDCP 2.2 support 4K/60p HDR), LAN port, HDMI ARC OUT (for connecting the soundbar to your TV if your TV features HDMI ARC input), USB port (for audio playback), analog 3.5mm input port, digital optical input (you can use it if your TV doesn’t have HDMI ARC input). There are also two IR repeaters and AC input. The subwoofer weighs 17.9 pounds, it’s 7.5 inches wide, 15.1 inches high, 15.25 inches deep. Inside the subwoofer, there is one 6.4-inch cone type driver with 100W output power. On the front panel, you will see the bass reflex port and power/status LED indicator. On the rear panel, there are power button, LINK button, power input, and ventilation holes. Subwoofer connects wirelessly to the main unit (soundbar) through 5GHz frequency so it shouldn’t cause any interference with your home Wi-Fi network. Rear speakers weigh 2.2 pounds each, they are 4 inches wide, 6.1 inches high, and 4 inches deep. The maximum output power of each speaker is 50W (100W combined and 20W RMS per speaker). Each rear speaker features one 1.8in full-range driver. Speakers connect wirelessly (they use 5GHz frequency just like the subwoofer) to the soundbar and they pair automatically the moment you plug them in and press the power button. If they don’t pair automatically, you can pair them manually – there’s a LINK button on the rear panel of each speaker. They can be mounted on the wall or on floor stands, or you can put them on your couch or on a table behind your sofa. Remote that comes with Z9F is one of the most comprehensive soundbar remotes we’ve seen. You can use it to control every singly aspect of the reproduction (select input, sound mode, adjust volume of each speaker, play with the advanced settings, etc.). Sony always makes elegant and stylish products – Z9F is the perfect example. The soundbar is slim and stylish. The subwoofer is compact. Both soundbar and subwoofer are made of hard plastic but they still look sturdy. The installation process is very simple. You should connect all the devices first and then plug in the soundbar, subwoofer, and rear speakers. They will pair automatically. After that, you have to go through a step-by-step setup process. It’s relatively quick and simple – you just have to follow all the instruction from the on-screen-menu (in order to do this, you need to connect your TV to the soundbar through HDMI ARC). We should probably mention that there is no auto calibration mic – you have to enter the distance between the soundbar and other speakers manually (you will be asked to enter the distance at some point during the setup process). Some people prefer connecting all of their devices to the TV and then connecting TV and soundbar through HDMI ARC but you can also connect 2 devices to your soundbar through HDMI (Blu-ray player and your satellite/cable box for example) – it’s all up to you. Also, you can connect TV to the soundbar wirelessly through Bluetooth but we still recommend wired connection (having a wireless subwoofer and wireless rear speakers is just enough). You can control all the sound and playback aspects through your soundbar remote. There are 7 sound modes available starting from standard and auto sound (this mode will make the adjustments depending on the audio input). There is also cinema mode (for more immersive surround sound experience), music, game, news (for clear dialogues), and sports mode (gives you the opportunity to feel the atmosphere at the stadium but also makes narrations more intelligible). You can activate any of these modes by pressing the dedicated button on your remote. There are also two special modes – Night mode (makes loud scenes quieter, increases the volume during quiet scenes, and reduces the amount of bass) and Voice mode (pushes certain frequencies forward and makes all the voices more intelligible). You can activate Vertical Surround Engine and get that immersive 3D surround sound effect with a vertical sound component at any moment (it doesn’t work in News mode). Still, vertical surround sounds much better in cinema and auto mode and it’s better for movies than for music. All Dolby and DTS surround sound formats are supported through HDMI inputs (if you connect your Blu-ray player through one of two HDMI inputs you can even play Dolby Atmos and DTS:X audio tracks). Through HDMI ARC output you will be able to play limited number of audio formats – LPCM (2 channels), Dolby Digital, DD+, Dolby Atmos, DTS 5.1, DTS ES Discrete and Matrix 6.1, and DTS 96/24 (not DTS:X or DTS HD High Res or Master Audio). If you are using an optical cable to connect some of your devices to the soundbar you will be able to play Dolby Digital 5.1, Dolby Dual Mono, DTS 5.1, and LPCM (2channels). You will be able to play a wide variety of audio files through USB input – DSD, WAV, FLAC, ALAC, AAC, mp3, WMA, etc. Z9F features Bluetooth 4.2 (class 1). Bluetooth connection works flawlessly. You can use it to pair any of your Bluetooth-enabled devices with Z9F. The soundbar will memorize up to 9 devices. Besides Bluetooth connectivity, you can connect the soundbar to your home network (through LAN port or wirelessly through Wi-Fi). Soundbar has built-in Chromecast so you can stream music and podcasts from any of the Chromecast-enabled streaming services. You can also use Google Home with Z9F. On top of all these features, you can install and use Sony Music app (previously called SongPal) to link all your Sony soundbars and other compatible Sony wireless speakers together and make a multiroom speaker system. Also, you can use this app to access some of the most popular streaming services (like Deezer or Spotify) and stream music directly from this app. The main unit has only 2 HDMI inputs and one HDMI output and some of you might find this insufficient. You can always connect your other devices to your TV. This system is appropriate for smaller and maybe mid-sized rooms but it is definitely not powerful enough to fill large spaces with sound. You can’t really expect three small speakers (+2 rears) and a relatively small subwoofer to be that loud. When it comes to Dolby Atmos and DTS:X we can’t say that we were amazed by the vertical sound component. It makes some difference and kind of feels like there is something going on above your head but it won’t make you look up thinking here comes the helicopter. Still, it’s pretty good for a soundbar. Polk is a famous US audio equipment manufacturer with more than 40-years long tradition. Their products are relatively affordable (though not as cheap as generic brands) and deliver pretty good performance for the price. 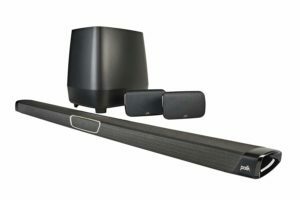 Polk is another reputable speaker manufacturer that tried to enter the wireless surround sound system market. They are definitely not the best out there, but they are getting better with every new product. Their Polk Audio MagniFi Max SR home theater system can be considered a cheap alternative for our favorite SONOS 5.1. MagniFi Max SR is not as great and reliable as SONOS 5.1, but it’s pretty good. The best thing is that you can have it for $400. Compared to more than $1,500, which is the price of SONOS 5.1, this is a very good deal. It’s also good to know that you don’t have to buy all the speakers at once. You can buy soundbar and subwoofer first for $300 and then make an upgrade if you want to. MagniFi Max SR comes in an unusually-shaped red box. All the fancy features and specs are listed on it. Inside the box, you will find the soundbar, subwoofer, two surround speakers, power cords for all the speakers, remote control (batteries included), one high speed HDMI cable (6.5ft long), one Toslink digital optical cable (6ft long), one 6ft long AUX cable, two wall mounting brackets (mounting templates are included, but other hardware isn’t), user manual, and a warranty card (3-year warranty for speakers). You won’t get all the necessary cables and if you want to connect more digital audio sources, you will have to pay extra for 3 additional HDMI cables. The soundbar has a very slim profile and can be easily positioned below your TV (on a table or mounted on a wall). It’s 43 inches wide, 2.1 inches high, 3.8 inches deep, and weighs 6.1lb. The soundbar looks quite attractive. 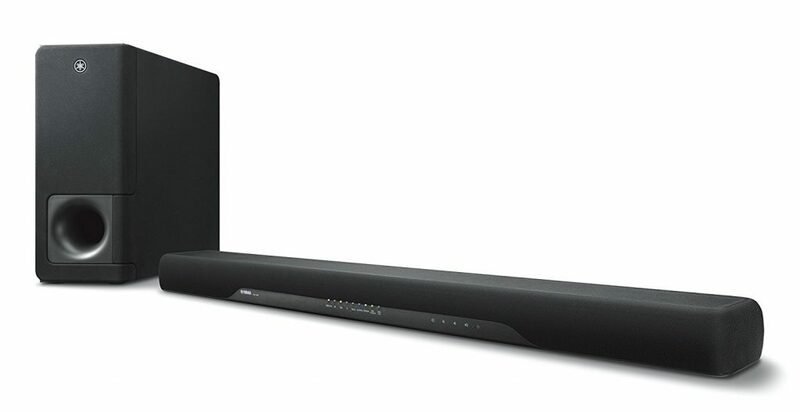 In a way, it’s similar to Yamaha’s soundbar YAS-207BL, only less sophisticated. Front and top panels are wrapped in fabric grille that protects the drivers. On the front panel, behind the grille, there are 10 status/source LED indicators. On the top side, right in the middle, there’s a simple control panel. You will see 8 buttons – power, source, Bluetooth, master volume buttons, Voice Adjust volume buttons (used to control the volume of certain midrange frequencies), and mute button. There are quite a few inputs on the rear panel. You have 3 HDMI inputs (support 4K HDR passthrough), one HDMI ARC output port (you can use it to connect your TV to the soundbar if your TV features HDMI ARC), one digital optical input (if your TV doesn’t have HDMI ports which is almost impossible, you can use this one), AUX input (you can use it to connect any analog audio source), Ethernet port, USB port for firmware updates (you can’t use it for music playback), wi-fi reset button, sync button with SUB and SURR sync status LED indicators, and power input. Inside the soundbar, there’s an array of 7 drivers – 4 oval full-range drivers (1in by 3in), 2 0.75-inch tweeters, and one 1-inch midrange driver in the center. There are bass ports on the left and right end. The subwoofer is pretty massive. It’s made of hard plastic and it’s completely black. The shape is a bit unusual (not a standard boxy sub). The subwoofer is 14.5in high, 14.6in wide, 12.1in deep, and weighs 13.5lb. On the rear end of the subwoofer, there are only soundbar sync button with sync LED indicator, and power input. The subwoofer is completely wireless and has no speaker wire terminals. It can only be used in combination with MagniFi Max SR soundbar. The subwoofer features one down-firing 8-inch woofer. The enclosure is ported. The bass reflex port is located on the bottom, right next to the 8-inch driver. Surround speakers are also wireless. They are quite small and feature the same kind of design as the soundbar. The front and top panels are wrapped in a grayish grille and the rest is made of plastic. On the rear panel, there’s a threaded insert (for mounting on the wall), and one sync button with a sync status LED indicator. Each surround speaker features one 3-inch driver. The system has the peak output power of 400W and its frequency response spans from 35Hz to 20kHz. Inside the packaging, you will also find the remote. You can use it to turn on/of the soundbar, activate different modes (night mode, sport, movie, or music mode), select the source (HDMI 1-3, TV, AUX, Bluetooth), adjust the volume (master volume, bass volume, Voice Adjust volume, and surround volume), adjust the surround balance, and control the playback (play/pause, forward/rewind). The design is quite stylish. Those glossy plastic edges look a little bit cheap and fragile. The overall impression is still very good. We are a bit worried about the build quality but there have been no complaints in the past and that’s reassuring. The installation is more than simple. All the sources should be connected to the soundbar, and the subwoofer and surrounds just need to be plugged into the power outlet. Once you connect all the sources, you will have to sync the soundbar with the subwoofer and surround speakers (by pressing the sync button on the soundbar and then on other speakers). When all the speakers are synced, you can play music or watch a movie. The installation should last no more than 10-20min. If you want to mount the soundbar and surround speakers on a wall, it will take a little bit longer. The system supports the most common Dolby and DTS surround sound audio formats, including DD+. Object-based DTS:X and Dolby Atmos are not supported. The soundbar also features Voice Adjust Technology (also patented by Polk) which is supposed to improve the intelligibility and enhance the voice reproduction. There are four different sound modes – movie, music, sports, and night mode. Movie mode boosts the bass and improves the surround sound and voice clarity. It’s optimized for movies and TV and it’s a default sound mode for optical and HDMI inputs. Music mode does a completely opposite thing – it eliminates bass boost and surround sound effects. Sports mode is supposed to enhance dialogues and night mode is supposed to drastically reduce the bass and improve the voice intelligibility. You can also adjust the sound to your likings instead of selecting some sound mode thanks to separate volume controls on the remote (master volume, voice volume, bass volume, and surrounds volume). The soundbar is compatible with some of the most popular TV brands like Sony, LG, and Samsung and if your TV is made by one of these reputable manufacturers and if it supports CEC you can use your TV remote to control the system volume, select source, etc. If it doesn’t support CEC, you can use the IR learning feature to ‘’teach’’ your TV remote to control different things. The soundbar features built-in Bluetooth and wi-fi module. Bluetooth can be used for streaming music but it’s not good enough for watching videos because of noticeable sound delay (lack of aptX support). The soundbar features built-in Chromecast and you can use it to stream audio (but not video) from your phone/tablet to MagniFi Max SR. In order to do that, you have to install the Google Home app on your phone (available for Android and Apple devices). There is no dedicated Polk app that you can use to control this surround sound system. In order to perform the initial setup, use IR learning feature, and check which source is active, you have to look at those LED lights on the front panel of the soundbar. Different combinations of LEDs indicate different modes, sources, etc. It’s not such a big issue since everything is nicely explained in the user manual, but some on-screen display would be a much better option. Just like with many other wireless surround sound systems, you may experience some interference issues with MagniFi Max SR. Some long-term users have reported problems with popping/cracking sounds coming from the subwoofer and/or surround speakers and the only explanation given by the manufacturer is the interference. In some cases, moving the speakers and router further away from each other solved the issue, but in other cases, the issue was still there. It’s really hard to predict is it going to be an issue in your case. Damson is a UK-based headphone and speaker manufacturer. The company was established in 2012 and their most successful products are wireless bone conduction headphones and wireless home theater system called Damson S-Series. This is one of the ‘’most wireless’’ and most portable home theater systems on the market. It’s also one of the most convenient ones (mostly because of completely wireless and battery-operated surround speakers), but it’s not all that great. Damson S-Series is a combination of very good and convenient features and some really disappointing ones. We were particularly disappointed by the audio quality, especially the bass reproduction. We have expected a little bit more from a surround sound system with a $900 price tag. The best reason for buying this surround sound system is the convenience and wire-free environment it offers. None of the wireless surround sound systems we’ve talked about are completely wireless and all the speakers have to be plugged in. Damson went one step further and made the surround speakers completely wireless. On the other hand, Damson’s center speaker and subwoofer have to be plugged in, which means that Damson S Series home theater system is not completely wireless. It’s just more wireless than other systems on this list. The system comes in a relatively small package (compared to other wired and wireless home theater systems). It weighs 16lb and inside the box you will find the S-bar (for some reason, Damson puts S in front of every speaker) which is your center channel, S-Atmos speaker, S-woofer (this is a small subwoofer and also your hub), 2 wireless S-cubes (surround speakers), 2 power cables for the S-bar and S-woofer, 2 power/charging cables for the S-Cubes, wall brackets (in case you want to mount surround speakers on the wall), and a QR code (when you scan it with your phone, you will be redirected to the user manual). You will also get 4 adapters for each power cable (for US, UK, EU, and Australian market) and a simple remote (batteries included). This system is really small, probably the smallest we have ever reviewed (including wired and wireless home theater systems). Every single speaker is tiny, including the subwoofer (S-woofer). It’s much lighter and smaller than any regular 8-inch subwoofer. S-woofer has one front-firing driver. The enclosure is sealed. The S-woofer is also the hub of the system. All the inputs and outputs are on the rear panel. There are 2 HDMI inputs, 1 HDMI ARC output, AUX input, and the power input. The front panel is covered with a semitransparent black grille. The Damson logo is at the bottom. The S-bar is supposed to be your center but also your left and right channel. It’s the smallest soundbar we’ve ever seen. You are supposed to use it in combination with the S-Atmos (which is Atmos height module). On the top panel of the S-bar, there are four buttons – M (for shifting between different sources), 2 volume buttons, and the play/pause/pairing button. In the top right corner of the S-bar, there’s an LED source indicator (different colors indicate different sources – you can find the explanation of each color in the user manual). S-Cubes are designed as surround speakers but they can also be used independently from the system. You can use it as a simple Bluetooth speaker or you can combine multiple S-Cubes (up to 16) and make a nice multiroom speaker system. S-Cube has 4 control buttons on the top – power button (you can also use it to shift between Bluetooth and JetStreamNet which is an ad-hoc wireless network used by the Damson S Series speaker system), 2 volume buttons, and play/pause button. You will also see some buttons and inputs on the rear panel. There are JetStreamNet pairing button (for pairing multiple S-Cubes together in a multiroom system or for pairing S-Cubes with the rest of the home theater system), 3 music mode buttons (left, right, stereo), reset button, AUX input, and DC charging port. First of all, the speaker system looks really nice. The design is simple but very stylish. If you have a very small room and you don’t want to deal with cables, Damson S Series system could be a very good solution. The number of different connections is satisfying but far from amazing. You have two HDMI inputs, HDMI ARC output, and AUX input. Bluetooth connection is also supported. The HDMI inputs/outputs support 4K passthrough and HDR10. They are also HDCP 2.2 compliant. All the speakers communicate with each other via the JetStreamNet ad-hoc wi-fi platform, which works pretty well. We haven’t experienced any syncing issues. It takes some 20-30min to install the system, connect the sources (HDMI cables are not included) and sync the speakers. The S-Cube rear surround speakers feature built-in rechargeable batteries. The battery capacity is rated at 1,500mAh and it is supposed to deliver up to 8 hours of playtime at 70% volume. In our testing, we were able to get almost 8 hours, but only at 50% volume. The idea of having completely wireless speakers sounds nice, but the playtime is not that impressive. Another interesting thing is that you can use the S-Cubes as independent speakers, not only as your surround speakers. You can play the music in AUX, Bluetooth, or JetStreamNet mode. You can also pair up to 16 S-Cubes for a multiroom speaker system. The remote that comes with the system is quite basic, but it’s functional. You can use it to select the input, adjust the volume, or control the playback. Damson S Series supports all Dolby audio formats including Dolby Atmos and Dolby True HD. It does not support DTS:X and it will convert DTS:X audio track to DD+. When it comes to audio performance and surround sound effects, we have some mixed feelings and impressions. The good thing is that it really delivers Dolby Atmos surround sound and it does that with surprisingly good accuracy and clarity. Even that small Atmos module (S-Atmos) delivers quite realistic object-based effects. It’s definitely not better than some Klipsch elevation speakers but it’s pretty good. The soundstage and the surround sound ‘’bubble’’ are bigger than we’ve expected from such a small system. The center channel is still narrow, and that surround sound bubble is not huge, but it’s definitely better than anticipated. The bass reproduction is the biggest issue. The S-woofer maybe looks nice, but the bass is tiny and it doesn’t really make the impact. S-woofer simply can’t deliver enough bass to produce that immersive listening experience. It really lacks some serious depth and body. Because of such a weak bass, the treble becomes more noticeable and a bit too bright at moments. This is even more noticeable when listening to music. In our opinion, this kind of audio performance doesn’t justify the price. This system is simply too expensive for what it offers. We are not saying it’s bad, but you can buy all kinds of wireless home theater systems for the same amount of money or less (Nakamichi Shockwafe 7.1 or 7.2, Enclave Audio CineHome 5.1, Polk Audio MagniFi Max SR, etc.). We’ve almost come to the end of our article on 10 best wireless surround sound systems. Hopefully, you have found something interesting on this list but even if you haven’t, you are probably more aware of what to expect and what to search for. If you are going to keep on with your search, let’s just make a small list of things you should pay attention to when buying a wireless surround sound system. The list of important features you should pay attention to when buying wireless surround system could easily be much longer, but we’ve decided to concentrate on three things only – sound quality, type of wireless connection (Bluetooth or Wi-Fi), and type of surround sound (true or simulated) along with supported surround sound formats. When it comes to sound quality there’s a lot of technical specifications you can look at – frequency response, rated output power, RMS, signal to noise ratio, Total Harmonic Distortion, etc. You should be searching for wide and maybe not perfectly flat frequency response but rather something with an emphasis on bass (it should go as low as possible and as high as possible). Output power and RMS should be as high as possible as well as signal to noise ratio, and Total Harmonic Distortion should be lower than 1%. But, in the end, your decision depends more on your perception of the sound than on some numbers and we highly recommend trying the system in the nearest audio store before buying it. Numbers can tell you a lot of things and you can see the difference between high-quality and poor-quality speakers through these numbers but it’s even more important to hear the sound and see if it’s pleasant and loud enough for your taste. Basically, you can choose between Bluetooth and Wi-Fi. We have already explained all the downsides and upsides of both connections at the beginning of this article. In short, Wi-Fi offers better sound quality and greater range but it’s a bit more difficult to install and it costs more. Bluetooth is easier to install and more ubiquitous (you can use it with pretty much all of your devices since all of them have Bluetooth while Wi-Fi could be a little bit trickier and you may experience some incompatibility issues). On the other hand, Bluetooth audio is compressed hence, worse than Wi-Fi audio. The other important thing is the number of cables you have to use. You already know that wireless surround sound systems are not really wireless and that some cables are always present but how many cables is the important question. The fact that you have to connect the soundbar (usually the main unit) to your TV and plug it into the wall outlet is not a big deal since you can easily organize the cables and hide them behind the TV stand or behind the TV. And even if you don’t hide them, they won’t make a mess on your floor and you’ll be able to walk without tripping over them. Much more important thing is that you don’t have to wire up surround and rear speakers to the main unit or to the receiver – that’s the thing you want to avoid and that’s what most wireless surround sound systems offer. In some cases, you will have to place your wireless (usually Bluetooth) subwoofer with built-in amplifiers behind or next to your couch and wire two rear speakers to the subwoofer. In our opinion, this is not such a great option since the cables are only repositioned and not eliminated. The only thing that you get with this system is the Bluetooth connectivity and the ability to stream music from your Bluetooth-enabled devices (and they are much cheaper). Some wireless surround sound systems feature 5 speakers just like traditional setups but you will more often see a soundbar (with 3, 5, or more drivers) combined with two surround speakers and a subwoofer or, in some cases, only soundbar with subwoofer. All of these surround sound system support 5.1 audio tracks (DD 5.1 and DTS 5.1), but some of them can simulate 7.1 audio or even object-based audio (Dolby Atmos or DTS:X). Simulation is never as good as real 5.1.4 or 7.1.4 surround system and it usually sounds a bit strange, but it’s nice little addition to the package and you will be able to play these two audio formats if you want to. WiSA is an organization established in 2012 in California. This is actually an industry group whose members are audio equipment manufacturers like Harman/Kardon, JBL, LG, B&O, Klipsch, Pioneer, Onkyo, Polk, Enclave, Martin Logan, etc. WiSA is an acronym for Wireless Speaker and Audio Association and its main goal is to establish some standards in Wi-Fi audio and video equipment and certify products (wireless speakers, wireless surround sound systems, AV receivers) that meet WiSA standards. The final idea is to include all the producers of wireless audio equipment into this organization, establish some universal standards and make all the wireless surround sound equipment interoperable and reliable. At this moment, there’s a long road ahead of this organization since some of the famous manufacturers of wireless speakers and surround sound systems (like SONOS or BOSE) are still not members and there is no unique standard for all the wireless surround sound systems. But, you can be assured as a customer that all the WiSA certified products (like Enclave 5.1 that’s on the list) meet WiSA requirements and that they are reliable, interoperable with other WiSA certified equipment, and easy to set up. Being aware of Yamaha’s quality when it comes to musical instruments I didn’t have any doubts which sound system to buy, plus it fits into my budget. Right now I can say that I am satisfied. The setup was easy and straightforward. Pairing the soundbar and the subwoofer was simple as well. 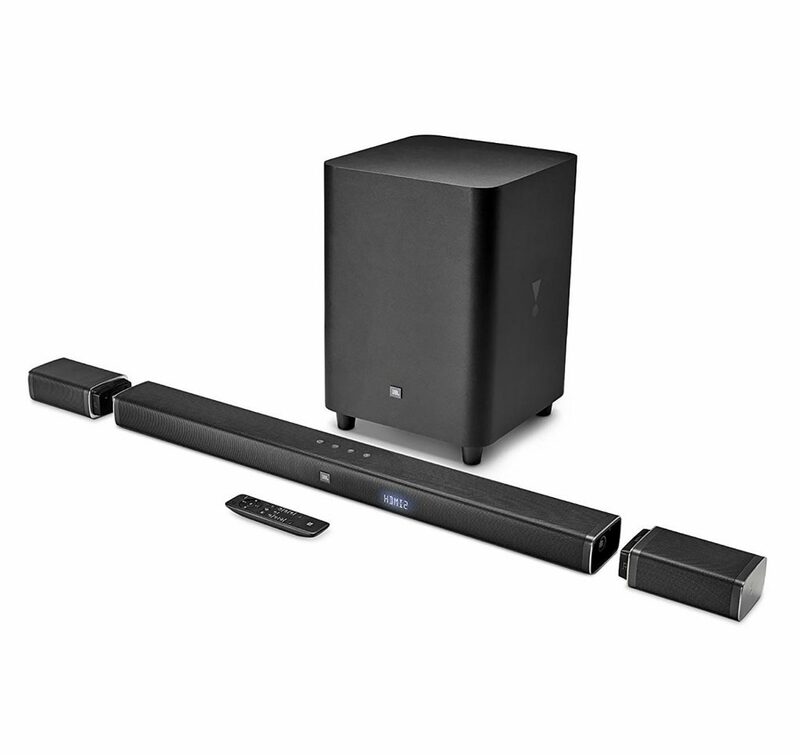 My overall rating for Yamaha YAS-207BL Sound Bar is – NOT BAD. Thanks for sharing your experience. YAS-207BL is not bad at all and it does offer pretty good performance for the price. What we didn’t like is the surround sound simulation which is not exactly great and the limited number of inputs/outputs. If you can live with that, then YAS-207BL is a great option. We are glad you’re happy with the purchase. I was initially looking to buy the Sonos 5.1 soundbar but ended with JBL Bar 5.1. The main reason was the price and I have to say that I am extremely happy with the purchase. The system is simply amazing. I especially love the quality of the sound and the bass. You won’t make a mistake if you choose this one! Thumbs up! Thanks for sharing your impressions. We’re glad you’re happy with the JBL Bar 5.1. Hi, nice writing James. I am interested into the Polk Audio MagniFi Max SR. Can you please tell me whether it works with Amazon Echo? Another thing I’d like to know is what would be the maximum allowed distance between the soundbar and the surround speakers so they can still work? Thank you for your comment. MagniFi Max SR doesn’t have Alexa built-in but you can connect it to Amazon Echo via Bluetooth. If you want something with Alexa built-in, you should check out Polk Audio Command soundbar. We can’t give you the exact figure for the max. distance. In our case, the distance was approx. 15ft (maybe a little bit more) and the surround speakers worked fine. I have recently purchased the Sonos 5.1 Home Theater System based on your review. I have to say I’m more than happy with the purchase. The setup was quite easy, the sound quality is amazing. Definitely money well spent. We are so glad to hear that you are happy with your purchase. And thanks for sharing your impressions. At last found professional site with detailed information of sound bar home theatres. Was not aware of speakers working on bluetooth and some working on wifi. Also got to know first time through you that, sound output quality differences exists between wifi and bluetooth. How about BOSE 700a along with 700 bass module and rear surround speakers?. There is no mention of Bose in your review?. Bose Soundbar 700 was released in October and we didn’t have the chance to test it yet. The last update of this article was done a few weeks ago and we will do another update in a few weeks. We will try to obtain and test this Bose surround sound system ASAP. Thanks for your suggestion. I enjoyed reading through your reviews but still can’t decide which one to choose. If you were in my shoes which surround sound system would you buy for yourself? Since I am not a techie person I always have trouble when installing new electronic equipment. However, I have to admit that the Nakamichi sound bar system was quite easy to install. It literally took me a couple of minutes to set everything up. The design and quality of materials is top notch, just like the sound. It doesn’t matter whether you are listening to your favorite songs or watching a movie, the sound is clear. I especially like the Bluetooth feature. Pairing it with my iPhone was quite simple and easy. I would definitely recommend this system to my friends. Thanks for sharing your impressions. We are glad you’re happy with the purchase. One question though – if you don’t look at the price, which one would you recommend: Sony HT-Z9F or Sonos 5.1? Sony’s HT-Z9F combined with two rear Z9R wireless speakers is a pretty impressive and very stable and reliable surround sound system. In some aspects, HT-Z9F is even better than the SONOS. For example, HT-Z9F is much more versatile. It features a bunch of connections including 2 HDMI inputs, 1 HDMI ARC output, digital optical input, USB input (for connecting flash drive and playing files directly from it), and 3.5mm input. On the other hand, SONOS bar has only one digital optical input. Also, Z9F features support for every surround sound format you can think of (including object-based Dolby Atmos and DTS:X) while SONOS supports only Dolby Digital 5.1. Both systems have Ethernet ports and they both connect to your Wi-Fi network. Z9F also features Bluetooth connectivity, it has Chromecast built-in, it’s compatible with Alexa and with Google Home. As you can see, there’s a lot of things to like about Z9F but there is one thing about SONOS that makes it better. It sounds better than Z9F. It’s bigger, more powerful, and more immersive. Z9F does support (or rather simulate) object-based surround sound, but those object-based formats don’t really improve the experience that much. Buying Z9F is definitely not a mistake and if you want to save some $500, Z9F is a great option. However, we still prefer the sound performance of SONOS 5.1 surround sound system. 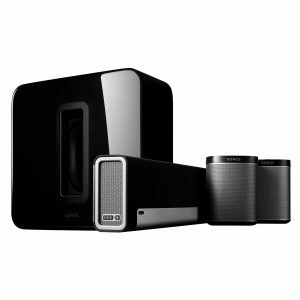 Hi, I am thinking of buying the Sonos 5.1 Home Theater System, but the price is a bit over my budget. However, the question is – Is it worth the price? I won’t mind paying some extra bucks if it’s worth it. When it comes to wireless surround sound and home theater systems, the main issue is their reliability. You don’t want to splash some serious amount of money on a system that cuts out and goes out of sync every now and then. As you probably know, WiFi connection is superior compared to Bluetooth (in terms of connection and sound quality, data rate, and reliability). So, if you are absolutely certain that you want to go wireless, you should concentrate your attention on WiFi speaker systems. That way, you are going to limit the number of viable choices. If you look at our list, there are only two WiFi systems – Sonos 5.1 and Enclave. These two systems are ”the most wireless systems” (there is no need for speaker wire but every speaker has to be plugged in). They are both pretty reliable and we haven’t experienced any signal loss or sync issues. Also, they both sound really good. Now, there are a few more things to consider. When it comes to connection versatility, Enclave is a clear winner. Sonos Playbar (which functions as a hub in Sonos 5.1 system) has only one input and it’s a digital optical input. There are no HDMI inputs. This is not a big deal if your TV has multiple HDMI inputs – you can connect all your sources (Blu-ray player, gaming console, Roku, Amazon Fire, etc.) to your TV and then connect the TV to your Sonos playbar. On the other hand, Enclave 5.1 features 3 HDMI inputs, 1 HDMI output, digital optical input, and 3.5mm input. So, Enclave is definitely more versatile. You should also consider supported audio formats. Sonos 5.1 supports only Dolby Digital 5.1 (DTS 5.1 is not supported). Enclave 5.1, on the other hand, supports both Dolby Digital and DTS. Luckily most of today’s Blu-ray discs as well as Netflix movies have Dolby Digital 5.1 surround sound audio tracks. When it comes to design, Sonos 5.1 is a clear winner. Enclave 5.1 is simply too ordinary. So, is Sonos 5.1 worth the price? We think it is. The lack of connection versatility and lack of support for DTS surround sound are important flaws, but they don’t have to be deal breakers. Still, if you can’t afford it (or simply don’t want to spend that much on a wireless surround sound system), you should definitely check out Enclave 5.1. When it comes to Bluetooth surround sound systems, Nakamichi Shockwafe 7.1 system is, at least in our opinion, the most reliable Bluetooth system. There are also two upgraded versions – Nakamichi Shockwafe 7.2 and 9.2 (we didn’t have the chance to test them). If you are curious about Bluetooth surround sound systems, check out these systems. your reply got me a little confused. Why is it you name the Nakamichi as the most reliable Bluetooth system even though you complain about having to re-pair due to connection losses? Going from the review the JBL system seems most reliable since it retains a stable connection and no major drawbacks are mentioned. First, let’s talk about Nakamichi. We’ve experienced some connection issues but it was actually our mistake. Here’s the deal – we are trying to test every surround sound system under the same conditions, which basically means the same room, the same equipment (TV, AV receiver, etc. ), and the same speaker placement. That usually works fine with wired surround sound systems, but when it comes to wireless surround sound, speaker placement plays a huge role. In our testing, the sub was placed in the front left corner and the soundbar was on the shelf beneath the TV. There was a 3ft tall cabinet between the soundbar and the subwoofer, but we didn’t consider that a big deal. After all, Bluetooth connection doesn’t actually require clear line of sight and the distance between the sub and soundbar was approx. 10ft. That kind of speaker placement and furniture arrangement didn’t work well for Nakamichi 7.1 and it happened twice in 7 days (which is our standard testing period) that the system lost connection and we had to reset it. It was nothing tragic or unacceptable, but we still had to mention this issue. Now, we don’t usually do long-term tests (it is practically impossible to that when there is so much equipment to review), but Nakamichi 7.1 was an exception. So, we played a little bit with the placement. It turned out that if you place the subwoofer right next to your couch (or achieve clear line of sight between the sub and the soundbar in some other way), like in the picture below, you can actually get much better results. We’ve had no connection issues for 2 months. So, even though Bluetooth connection doesn’t require clear line of sight, it’s not recommended to have any obstacles between the soundbar and subwoofer. Now, let’s talk about JBL 5.1 Bar. This system is Bluetooth-enabled and it does feature more capable Bluetooth version than the Nakamichi 7.1 (4.2 VS 3.0). The thing is – according to the JBL 5.1 Bar user manual (Specifications, page 10, Wireless transmitters/receivers section), those wireless speakers communicate with the soundbar via 5.8Gh wireless frequency (not via Bluetooth which is 2.4GHz). You can use the Bluetooth connection to pair your iPhone, iPad and other Bluetooth-enabled devices with the system and stream music, but that’s not how the speakers and the subwoofer receive the signal from the soundbar. At least, that’s how we understand it. So, in a way, JBL 5.1 Bar is more like Enclave Audio CineHome HD 5.1. It uses its own 5.8GHz wireless frequency for communication with the speakers, which improves the stability of connection and reduces the interference with the standard single-band wireless routers and other wireless equipment working on 2.4GHz. Thank you for your suggestions. We are going to make an update soon. At the moment, we are discussing Shockwafe 9.2, Klipsch Reference, as well as Denon Heos sytem with wireless subwoofer and wireless surround speakers.